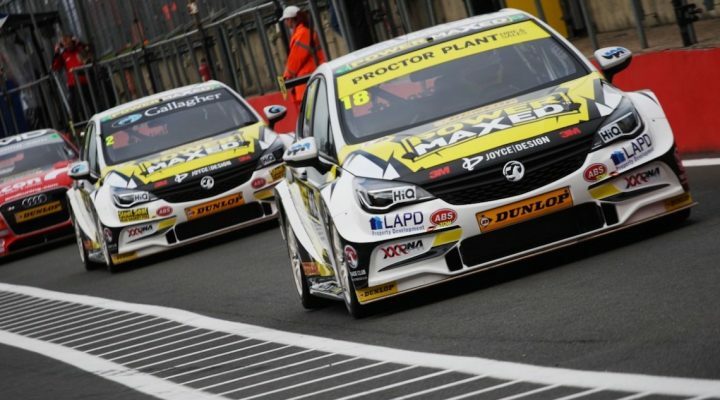 Power Maxed Racing’s Vauxhall Astra made an impressive competitive debut in the Dunlop MSA British Touring Car Championship, with Tom Chilton taking to the rostrum and Senna Proctor clinching the Jack Sears Trophy, while the team itself was awarded Manufacturers’ honours. After a tricky qualifying session around Brands Hatch Indy for all concerned, given a smattering of stoppages and on-off rainfall, Chilton and Proctor would line up 12th and 16th for the opener. Round one yielded a top ten finish for the more senior of the outfit’s driver pairing, and Proctor’s maiden outing saw him net 17th and Jack Sears honours as the best-placed rookie. It was Vauxhall and PMR’s return to silverware, gaining Manufacturers’ honours for race one. Both drivers worked their way up through the field in the second bout of the day and straight into the thick of the action. Proctor’s choice of the Option tyre proved prudent as he gained ground early on and a timely Safety Car further bolstered Proctor’s selection, allowing the softer rubber brief respite. Chilton wasted no time in passing Jack Goff’s Honda moments after the restart and the pair both continued to charge hard until the final tour – ninth and 13th their eventual finishing berths and another JST went the way of Proctor. A favourable reverse grid draw saw Chilton on pole position for the final race of the day. The fast-starting rear-wheel drive BMW of Andrew Jordan beat him to the first corner, though, and he would stay second as long as lap eighteen before Colin Turkington in the sister BMW found a way to break Chilton’s defences – not that the end result would in any way prove to be a disappointment to the BTCC returnee, who proclaimed the podium finish felt ‘as good as a win,’ all things considered. Proctor rounded things off by bringing the car home once again, this time 19th – enough to clinch overall JST honours on a debut weekend to remember. “It was a good start to my first BTCC race. The car felt good and went well, plus we landed top rookie and top manufacturer, ” said Proctor. “I got a good start on the restart in race two and held my position as the soft tyres came in. The car felt excellent, and the Safety Car halfway through gave the tyres time to cool. To get points in my second race was a great feeling. “I got a poor start in relation to the rear-wheel drives but I got a better restart after the red flag. The car felt awesome as we’d set it up for a strong second half of the race. We got the balance just right as the fronts went off; we finished with a great little car.